As a child, I was puzzled by life. Not to say that I was constantly puzzled. The feeling was tempered now and then by milder states of bafflement, bewilderment, and, on days of relative lucidity, simple confusion. Still, I’d imagine a time off in the distant future of adulthood, when the dust would settle, the fog would dissipate, and the smoke would clear. (I don’t remember the exact metaphor, but I know there was a lot of coughing and squinting involved.) As a grown-up, I would begin the satisfying task of gathering pieces of understanding — the way a stamp collector accumulates rare specimens — and storing them in my mind. I patiently waited for this gift of insight to arrive, right through my teenage years, into my twenties and thirties, and beyond. For a long time I tried to convince myself that I was just going through what my mother called “an awkward stage.” So far that awkward stage has spanned five decades, and shows no sign of relenting. Needing a back-up plan, I’ve decided to replace the stamp album of wisdom with a twenty-volume set of hardcover books, probably titled Things I Just Don’t Get. Each volume will be richly illustrated and fully footnoted, featuring a compehensive appendix and cross-referenced index. It will also be annotated. (I don’t know what annotated means, but I intend to find out.) What follows is but a tiny sample. Sometimes in the winter, my feet get really cold and I wear socks to bed. Now I guess we warm up when we’re asleep, because in the morning I’m not wearing the socks anymore. I never remember taking them off, and frequently I can’t even find them. Could this mystery be related to alien abductions? It’s possible that these beings aren’t traveling here from other worlds in order to manipulate our DNA or infiltrate our civilization. Maybe they just need socks. Do we really use just ten percent of our brains? I remember learning this in a high school class, and my first thought was, “You mean we’re being taught by someone who, if he had nine-tenths of his brain removed, we wouldn’t be able to tell the difference?” In a moment of unprecedented discretion, I did not raise my hand and ask that question. Why are there reserved parking spaces for expectant women? If you can take aerobics classes when you’re pregnant, why can’t you walk forty feet to get into the mall? What could I accomplish with my time if I didn’t spend so much of it trying to open plastic trash bags and jars of salsa? How many weeks have I lost rinsing out almost-empty shampoo bottles? How many months have I spent watching that spinning pinwheel on my computer screen, or listening to a recorded message telling me how important my call is? 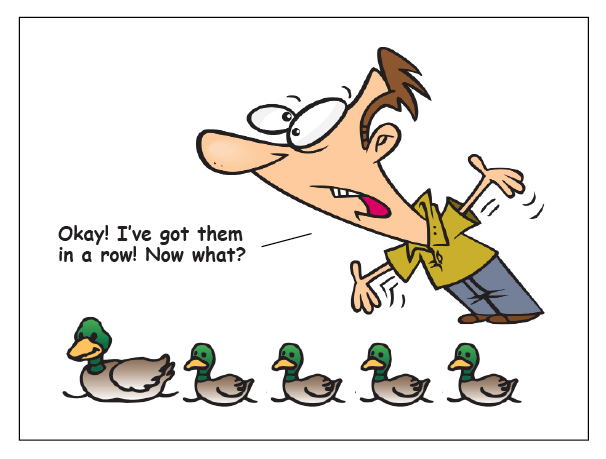 Once I get all my ducks in a row, what do I do then? When infomercials offer me an “eighty-dollar value” for the special price of just $19.95, who’s paying the eighty dollars? The products are available only through the television ads, and they always offer the same price. So the truth is, no one has ever paid eighty dollars, and I don’t know about you, but that makes me feel less special. Don’t we have enough different kinds of pasta now? I like variety as much as the next person, but the only shapes left are the nine-pointed star and famous world religious figures. And speaking of religious figures, why do people always assume that the silhouette that appears on their burnt toast is an image of Jesus? I recognize that it looks like a man with a beard, but how do they know it isn’t President Garfield, or George Bernard Shaw? Or that guy who pitches for the Giants? Why are those small batteries so expensive? You can buy a watch for five dollars and it costs fifteen to replace the battery. It’s cheaper to keep buying new watches, while our landfills continue to fill up with the old ones. I haven’t worn a watch in thirty years. I’ve saved several million dollars on batteries and have done more than my share to protect the environment. The only drawback is that I have to constantly ask people what time it is. When exactly does push come to shove? I’m never sure when to stop pushing and when to start shoving, but I don’t bother asking anyone because I know that it’s in their best interest to move into the shoving phase while I naively continue to push. Where is the wazoo? Is it an actual body part? Sometimes when you go into a store and ask the salesman if they have portable DVD players, he’ll say, “Are you kidding? We have portable DVD players up the wazoo.” This may be some clever response he was taught in sales training, but it doesn’t induce me to purchase. In fact, it makes me think I don’t really need a portable DVD player. A related expression is “up the yin-yang.” As in, “You need a raincoat? We’ve got raincoats up the yin-yang.” Again, I don’t wear a raincoat, and I doubt the chance to obtain one from someone’s yin-yang would convince me to start now. Living in Canada, I appreciate the luxury of heated seats in the car. But why can’t I remember to turn them off at the end of spring? Sometimes I’ll go right into July with the air conditioner on full blast, sweating like a lunatic and no idea why. How many is umpteen? When people say, “And so I called them again, for the umpteenth time,” I know it must be more than twelve, but it sounds much bigger, like maybe close to a hundred. I find myself fixating on the word, and the point of the story becomes lost. So just a reminder: If you’re ever trying to impress me with how many times you had to do something, use a real number, such as eighty-seven or 15,000. Umpteen will just make my mind wander. When you turn off a lamp, why does the room immediately go dark? (I can hear you rolling your eyes, but please, hear me out.) If we look at the stars in the night sky the light we see is made up of packets of energy called photons. Because those stars are hundreds and even thousands of light years away, the photons had to travel immense distances through space. Somehow they kept going and remained visible. The lamp in my house is sending photons bouncing off the walls, the ceiling, and every object in the room. Yet when I switch off the lamp, the light vanishes instantly. Where does it go? Why doesn’t it continue to zip around for a while? Some people have tried to explain to me that the light is absorbed by the walls and furniture. But if that were the case, why does the Moon reflect sunlight? If my coffee table absorbs photons, something as big as the Moon should absorb even more. That’s just common sense, even for me. I don’t know why, but I can’t let this one go. I’m planning an experiment. I’m going to cover the walls, ceiling, and floor of a room with aluminum foil. Then I’ll set up a lamp and a videocamera inside the sealed room. With the lamp on, I’ll remotely begin recording, then turn the lamp off. The light should reflect off the aluminum foil and keep bouncing around the room. Be honest: shouldn’t it? If I win the Nobel Prize for Physics, I’ll conduct a similar experiment on the disappearing socks in my bed. And if I don’t win, I may just open up a tanning salon. There’s no sense letting all that foil end up in the landfill. But here’s what I really want to know. If my mind is this boggled now, how many more things would be added to the list if I could just figure out how to use the other ninety percent of my brain? If [people who’ve been to a tanning salon are asked}, “Did you go on vacation?” they have to say no. No, they don’t. They can lie. Do we really use just ten percent of our brains? Given the state of our politicall discourse, I’d say yes. Why are there reserved parking spaces for expectant women? They have a well-funded political lobby. Once I get all my ducks in a row, what do I do then? Shoot them. OK – this is all in fun, but it does have a point. When there’s more than one answer possible for some of the important questions in life, we’d better be very careful about whose answer we accept! Oh this is just too rich, I’m gonna forward this to umpteens of friends. (Well OK – 2). Thanks, Joseph. I continue to enjoy your stories, as well. You seem to share the King of Siam’s dilemma of finding meaning in the world’s endless wonders, “Is a puzzlement!” And it’s no surprise because the things that make no sense outnumber the things that do – by a long shot. I’ve heard that 10% brain use statistic and was equally perplexed. It doesn’t seem like a reasonable assertion. It’s just too even. I’d be more likely to believe a number like twelve or twenty-seven. The King of Siam and I have a lot in common, Ray, except that I tend to have less trouble keeping my shirt buttoned. The brain statistic must be referring to our potential, rather than our physical brains; in that sense it’s safe from argument, because no matter what we do, we can always do more. I still wonder who came up with that reserved parking idea. I’d be willing to bet it wasn’t pregnant women. I have always been skeptical about the 10% of the brain thing (although I have met people who only use 5%). Why would the intelligent creator of all things, who designed this amazing human body, give us a brain that only utilized 10% of its capacity? If I am healthy, I don’t use 10% of my intestines, or 10% of my eyeballs, or 10% of my skin. I have always wondered how a person, who is only using 10% of his/her brain, even had the ability to figure that out. One thing about the special parking spaces for pregnant women – but where does that end? Why not have special spaces for people with migraines, or people with IBS (I think they really need to be closer to the store!) or people who are so absorbed talking into their bluetooth device, that they have no idea that there are cars going by? One last question – is umpteen more or less than a gazillion? There’s a world of difference between pushing and shoving. In fact, I believe if you’re caught pushing in a shoving match, you can be disqualified. I’m not sure about the brain thing, or any of those other organs. Although if I could figure out a way to use more than ten percent of my bladder, I might get a lot more sleep. Umpteen and gazillion are used in completely different counting systems, kind of like kilometers and miles. To convert from umpteen to gazillion, you multiply by 28, then add 5. After all these years, thank you for finally asking me something I know. Charles, were you always told to quit asking questions? That was the answer to a lot of mine. You’ve certainly given me some good ones to mull over for the next 20 years. Thank you for a delightful morning read, you wizard of simplicity. I think I drove my parents crazy with questions, Amy. But nature has a way of exacting revenge, and I grew up and had a daughter who could not only ask a hundred questions in five minutes, but ask each question twelve different ways. “Wizard of simplicity.” I got that, you know. You thought you could slip that by me, but I got it. Oh dang! Now I have to confess that I’m a Wizardette Wannabe! I can see magnificence in the ordinary, but you even spot the profoundity hidden in the not-so-magnificent. And you touch us one and all. ” You mean there are other choices? And my favorite: “Prosperity is right around the corner.” Well if it was so close why haven’t we had it all along? “Take it or leave it” must be related to “Like it or lump it,” which I’ve never been able to figure out. Have you? 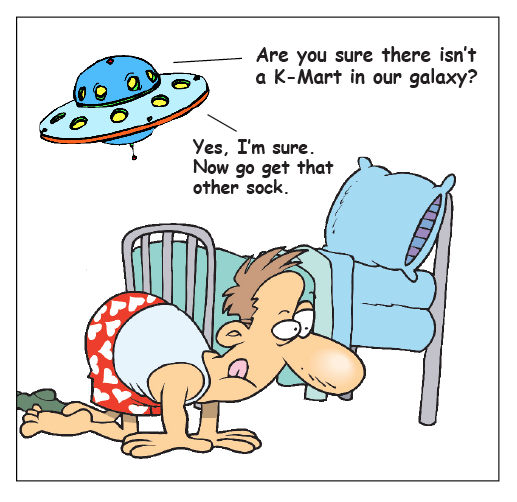 You may be spot on about the socks, there always seems to one missing as well, one legged Aliens maybe? I have never understood the parking spots reserved for the special Mums,but I must say that they seem to be able to walk around the shopping centers without any problems, and why is it that this was never needed before, has something changed that I should know about? I thoroughly enjoyed this. I thought I was the only one that had random things I just didn’t get. I was convinced for a long time that socks were eaten by washing machines or dryers, maybe in some conspiracy with the sock companies. I am forever losing a sock in one of those machines, but just when I’m convinced the sock will show up in the fold of a sheet when making the bed. I think it’s a great idea for a twenty volume set and you should start on it right away. I believe the light will bounce around the room. Another home run, Charles. While reading, I shook my head in agreement because I’ve pondered some of the things you mentioned (parking spaces for pregnant women, some of whom are on their way to aerobics class); I also laughed out loud over the ones I hadn’t considered (the origin of some of our goofy expressions (umpteen, wazoo, etc.). By the way, “annotated” simply means an explanation of how a source was useful to you as a researcher/writer/scholar. Annotations are part of the bibliography. I often require my students to do them. It endears me to them (not really, but I tell myself that). Thanks for brightening up an otherwise rainy, gloomy Sunday! I’d thought it would be fun to take one of your writing classes, but now that I know about that annotation requirement, I’m not so sure. Do you teach any easier courses? Well, I’ve been told my courses aren’t easy, which is why I try to make sure we have a little fun. I would say my Intro to Lit course is a hoot. You’re welcome anytime! Thank you Charles for brightening a rainy Sunday afternoon. Speaking of brightening; I believe you are absolutely correct, light does bounce around a room after we turn the light off, but light travels really fast and since we use only 10 percent of our brains, we see really slow, so it escapes our notice. And here I thought the dryer was eating my socks, perhaps it was demon possessed and requires quantities of rubber thread to keep up it’s strength, but now I see that it was the Grays all along. They can travel inter stellar distances but never developed the knack for manufacturing socks. There are some people who say the clothes dryer is really a portal to another dimension, Allan, so it could be a combination of the two theories. That would seem to make more sense than either of the theories separately. Ahhhh… now THERE is a great theory: combine heat, a spinning action (like in Time Tunnel) and elastic and you produce an inter-dimensional portal. I wonder if I could get a government grant to study that phenomenon! Only if you can first prove that you already know the answer and that it has no useful applications. After reading this, I am certain that you use at least 25 percent of your brain, possibly more. I’ve often been puzzled by the missing socks, too. I usually wake up missing one. This reminds me of those times I’ll see a lone shoe sitting in a puddle on the side of the road somewhere. I think, what on earth would possess someone to leave one shoe behind? Were they in a hurry? were they in danger? Did they fling it out of a moving car? And I haven’t worn a watch in years. I think it’s good that we need to ask people what time it is, at least we’re forced to have genuine face to face human interaction for a change. oh and by the way, this is the umpteenth time your blog had me laughing so hard I cried. I anxiously await your Nobel Prize and that book! “Did they fling it out of a moving car?” I think that’s exactly what happened, Darla. They took off one shoe, threw it out onto the road, and only then realized it wasn’t such a great idea. Rather than make the same mistake twice, they kept the remaining shoe and went home. Some people prefer to tie the laces of the two shoes together, then fling the pair over some telephone wires. It’s never occurred to me to do this, but I may give it a try one day. Yes, the classic “tying your shoes and flinging them over a phone wire trick”! Who are these people? where do they find the time? How did they do it? I’m sure it took them at least a gazillion tries and then maybe on the umpteenth time they nailed it. Or maybe there are now professional shoe throwers who do the flinging for you. They send you a pre-paid envelope, you mail them your shoes — along with preferred location and payment — and three days later your shoes are hanging from the designated wire. Because really, who has time to fling their own shoes these days? I asked Rob about the light thing. He’s an engineer. 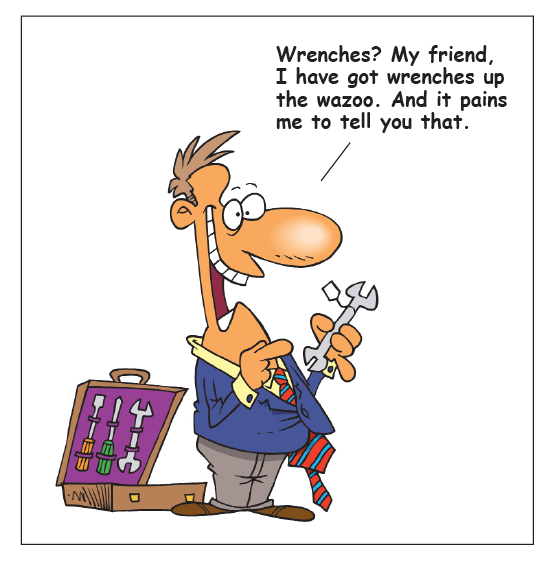 I assume, because he is an engineer, he knows about all sorts of things. I’ll ask him about your socks in a minute. So, anyway, I asked him why the light disappears instantly when you turn off the light. He said, “Because it gets absorbed by everything in the room.” Man, Rob is no fun. Like we hadn’t heard THAT response before. According to that online dictionary, umptieth is also a word. So there’s a distinction between the two — similar to that between fifteenth and fiftieth. This is getting complicated. Oh what a delightful hoot this was! Charles, you are indeed wise beyond your ears…oh, I meant years. @ rangewriter: Charles is also wise *between* his ears! Thanks, Charlie, for another great read. Please get started right away on Vol. 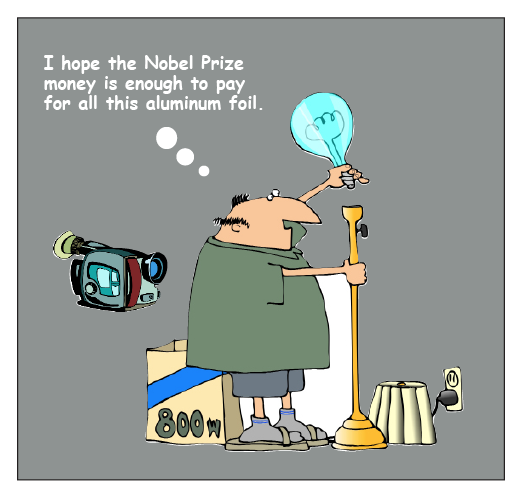 1–we await it eagerly, and it’s obvious from this sample that it will be a huge success: more than enough to pay for that aluminum foil, just in case the Nobel committee is shortsighted. Love the cartoons, too. Thanks, Linda and Marie. To paraphrase Mark Twain, the report of my wisdom is an exaggeration. But I appreciate your encouragement. Melinda, you are the Queen of Sock Posts, and I gladly defer to you. And you’re right: if anything, there should be reserved parking spaces for Harried Parents. I recently parked in one of the Expectant Mother spots, as a form of social protest. The revolution is coming. Can you feel it? Where do you get this tremendous energy and wit from, Charles? What makes you tick? That’ll be something I’ll keep wondering for some time. This is your characteristically wow post. Everything in it is a gem, an emerald, even. I find the way you inserted the one sentence about the ducks in the middle of really deep wonderments really very ingenious. Oh, and the socks? Your theory is going to go a long way! Keep a look out for UFOs. They just might come over to show their displeasure at your having found out their real intention. Thank you for giving me several laughs. I thought yours were the eyes I heard rolling, but maybe I was mistaken. Thank you for the emerald comment, and for appreciating that there can be humor in confessions of ignorance. That’s at least part of what makes me tick. My eye balls are well lubricated, thank you very much. They’re soundless when they roll. This is one thing I am learning from you — showing humour in confessions of ignorance. It’s usually eluded me. I see irony in mine. So, reluctant as I am, I am going to thank you. But just this once. I debated whether to use yin-yang or ying-yang. I’ll have to pay closer attention when people say it, or ask them to write it down for me — mostly because I just don’t get enough strange looks now. Amazingly humorous! You really should write a book. I’d buy it! Loved it! Thank you, estherlou. I’ll work on it. I am very stressed right now due to the fact that I’m flying in twenty-four hours to Canada to visit my aunts (who live in Vancouver – where are you, sir?) and from there am going to New York to start my second year in college – my point is, there is lots of packing to be done and I’ve been procrastinating. Now I’m utterly and entirely glad that I’ve been doing so, because I got to read this post, which made me very very happy. I thought I was the only one who dwells on things like this. I’m so glad I have company! My theory on ducks: I think that once they’re in a row, something magical happens and life makes sense. I think that ducks are very very very reluctant to be put in a perfect row, though, and perhaps that’s where the phrase came from. You know, or something. If you published this book, I’d buy it for myself and for everyone I know. I’m at the other edge of the country, in PEI. Where are you going to school in New York? No choking! I made it without killing a soul! I’m so proud of myself. I go to school at Sarah Lawrence College. Oh, we have enough different kinds of pasta now and enough different kinds of cereals, breads, yogurts, canned beans and peas and so on and so on… My honeymoon was taken in the upper peninsula of Michigan in a very remote part of it. It had the smallest of grocery stores. After 10 days, we returned home and I found that I had to go shopping to replenish our pantry. I got to the store, wheeled the basket into an aisle and promptly had a panic attack. I couldn’t make up my mind what to buy. I just wanted to grab the nearest two items and get the hell out. I often wonder, when I go into a large supermarket, what a first visit to such a store is like for people coming from other countries (or northern Michigan), where the shelves aren’t bulging with eighty-seven varieties of each item. Does it all seem incredibly great, incredibly vulgar, or just incredible? ‘The King of Siam and I have a lot in common, Ray, except that I tend to have less trouble keeping my shirt buttoned.’ Still laughing! As I’ve said umpteen times, I enjoy reading your readers’ comments and your responses just as much as your posts. That light thing is baffling. It reminds me of the time, as a 7th grader, I argued with my science teacher’s claim that everything loses color when there isn’t any light. That’s just impossible. I still get mad thinking about that debate. Stoopit science teacher. My science teacher said the same thing. I remember going into a closet with a flashlight, closing the door, and checking a sheet of red construction paper. And guess what: it was red. Stoopit is right. I think you should open your own Think Tank. Forget the Aspen Institute. I demand an annex: The Mostly Bright Ideas Institute where scientists can come and mull over such things as ducks in a row. The heck with writing a book – here’s your golden opportunity to bring together the likes of us, your readers. You can make the price of entrance $19.95, but if you act early, you can get a second person in for only the cost of shipping the tickets. Count me in, and umpteen others!! A think tank for useless ideas. EOS, you’re a genius. I’m going to talk to Allan about getting government funding. The ticket price seems a little steep, though. We’ll have to tell them it’s an eighty-dollar value. It must be trendy to wear mismatched socks in the alien land. They have got one of yours and one of mine at the very least. They have a lot more than one of mine, Kavya, and a few shirts, too. If I ever run into an alien, the first thing I’ll do is check to see what he’s wearing. I’ve asked that question about ink cartridges many times, Margie. But I still don’t know the answer. Obviously, more money can be made on expensive ink that we have to buy over and over, which is why they make the printers themselves so cheap. The real questions is, how did we allow ourselves to be backed into this corner? “You mean we’re being taught by someone who, if he had nine-tenths of his brain removed, we wouldn’t be able to tell the difference?” In a moment of unprecedented discretion, I did not raise my hand and ask that question. and that’s when I totally lost it, and the more I tried to stop the more I laughed… heh heh… I had to leave the library and finish writing this at home. Thank you BB, I haven’t laughed in a couple of weeks and it was the best tonic the doctor could’ve ordered. It makes me happy to hear that, Rosie. I know it’s been a difficult time for you, and I’m glad you were able to have a few lighter moments — even if it was in the restrictive environment of a research library. I hope you’re doing well. Yes thank you BB. What I realized is that in order to feel normal again, I needed to get back in front of my computer and start writing. I did, and it helps. And many thanks to you because inspiration came to me by way of this post of yours. Did you get the “pingback” that I quoted you? I did get the pingback, Rosie, although I’m still not sure what it means. It’s a good thing, right? To be quite honest, I’m not sure sure. Ping sounds like ding and I wouldn’t be very happy if someone dinged my car…. 1. People go to tanning salons for two reasons. One, to try to maintain whatever tan they might have gotten during the summer. Two, to try to beat the sun to the punch when warm weather comes along so they can go outside and not have to worry as much about sunburn. Now, never having to tan, I don’t know if that second one actually works, but they tell you that. 3. It’s not that pregnant women can’t walk, but no one wants them having to walk long distances while outside because it’s better to get them inside if they’re going to have that baby, especially when the weather’s bad. At least during aerobics they’re inside. 4. If you get your ducks in a row then you can just sit back and watch them swim faster because that’s why they do that in the first place, so the ducks following aren’t fighting the waves caused by the ducks in front. Of course, the ducks will get themselves in a row so you can just sit back and watch. 5. Skipping a bunch, we have so many different kinds of pasta because someone is already ready to buy another shape; you know, some folks get tired of the same ol’ boring looking stuff. And Jesus had longer hair than those other guys and that look of passiveness, whereas everyone else looked angry. 6. Small batteries are expensive because they last longer, and thus people don’t have to buy them as often. This means manufacturers of these things are losing money, and we just can’t have that now can we? 8. Skipping umpteen because someone just made that up as well, light goes out because the speed of light is faster than the speed you can blink or get anything else moving. Photons, electrons, none of that matters because we can’t see it anyway. Thank you, Mitch. This post has caused you a lot more effort than I intended (and more than it caused me). I think you should take the rest of the weekend off. By the way, your second point made me realize that it may be true that we’re using just ten percent of our brains at any given moment. But that’s very different from the original idea we’ve all heard expressed. Thank you, thank you, thank you for giving me a hearty laugh this morning! Oh my! I chuckled throughout, but I especially enjoyed your thoughts on the infomercials and the wazoo (I vow never to use that expression again!). If you ever put together that 20-volume set on all the things you don’t “get,” please reserve me a set–I’m quite certain that I will be able to agree with every bit of it (and laugh some more!). Just saw this–thank you for the mention! I do know first hand that the refrigerator light does NOT stay on when the door is closed…. Just tell me, please: When you checked, how did you get the door open to get back out? I sometimes forget to think ahead. Out of all the questions, my mind is stuck on the lamp one. I know my mind has all the answers hidden inside, but right now I can’t gather them in a right manner to get an answer. See, theoretical knowledge has its drawbacks. But I’ll think I’m sure. Let me try, as soon as you switch it off, there are no photons left to get reflected from the walls. Isn’t that right? I don’t know if that is the entire explanation. Let me know, please. And great writing. I just found out about your books. I’m amazed and now I want to read them too. I just noticed your comment after almost a month! I don’t know the explanation about the lamp. But someday, I hope to figure it out.